Summertime is the best time to enjoy berries at their peak. From juicy strawberries to sweet blueberries to plump blackberries and raspberries, there is a berry for you no matter what your tastes are! While berries are delicious to eat on their own, sometimes they are even better when used as a part of a dish to add flavor, color and nutrients, all while adding very few calories . Try these "berry" good ideas to see what I mean. Berry sauce: Puree berries in your food processor (you can do all of one kind or a mix), strain to remove any seeds and add a dash of sugar or honey to increase the sweetness, if needed. Then you can use this sauce over meats and fish for a sweet twist on a savory dish, or to dress up vanilla ice cream or even oatmeal! PB & B: Forget the jelly, which is high in sugar and low in fiber, and opt for berries on your peanut butter sandwich instead. They will still add that delicious fruity flavor, but they will make your sandwich much lower in calories and sugar and add fiber and texture to boot. 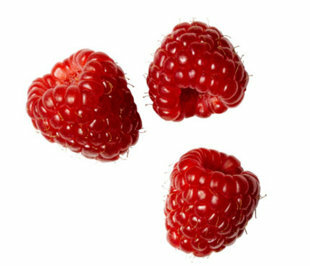 Berry ice: To cool down a drink without watering it down, try adding frozen berries. Their pretty colors will dress up any drink and provide built-in flavor. I love putting frozen mixed berries into my sparkling water! Berry salsa: As much as I love tomato salsa, dicing up berries (strawberries are great for this) to make a salsa ups the "wow" factor. Just combine diced berries with diced jalapeno, diced red onion and another favorite fruit, such as pineapple. Serve over grilled fish or on a salad. Berry bites: For the perfect sweet and savory summer appetizer, hull strawberries, then stuff with your favorite soft cheese (like goat cheese or ricotta). Berry drink: Blend frozen berries with orange juice until well-combined and frothy for the perfect refreshing summer afternoon beverage. What is your favorite berry and how do you enjoy it the most?